A personal finance blog which covers my journey to financial freedom as well as helpful advice, tips and tricks that I learn along the way. Merry Christmas everyone. I hope you all have a very safe, happy and enjoyable holiday season. Hopefully you can take this time to step back and re-assess your goals and priorities and come back in the new year refreshed and ready to take your personal finance journey to the new step. This is just a little post around Christmas to nudge you in the direction of some Christmas giving. The very nature of a personal finance journey means that we are often looking to improve our own lot in life. There is nothing wrong with this and focusing on my financial journey and blogging about it is one of the things I enjoy doing most. However it is easy to forget (especially as we start to build up some wealth, traction and momentum) that there are others who are less fortunate than ourselves. This is a little nudge to remind you (and myself) to give a little and hopefully improve someone else's Christmas. I love reading Michael Lewis' books - they are almost never dry (which financial books can often be) and he has a particular skill of weaving technical information in with the human experience to create a story out of something that most people would have trouble relating to. This is exactly the kind of book he has written with Flash Boys - a book dedicated to exposing the rise of high frequency traders and exposing an industry which most do not understand and fewer have an interest in exposing. What is Flash Boys about? Flash Boys is the book to read if you are a lay person looking to understand how High Frequency Trading works. It goes through the industry participants, how the board has been tilted against investors in favour of high frequency traders and how you (as an individual investor) and large institutional investors are being screwed by the stock market which is meant to be clear and transparent. So what is High Frequency Trading? I don't want to ruin the book and get into the specifics because it can be extremely complex but broadly speaking high frequency traders have better and faster information than anyone else in the market and can use this information to trade faster than anyone else and make a profit in the market based on this information. Most people don't understand High Frequency Trading because they don't understand how the stock exchanges are actually set up. They don't realise that most stocks are actually traded on multiple exchanges in a market. Why does this make a difference? Say you are looking to place a large buy order of shares in a market. Your broker sends it to exchange 1 and exchange 2 both at the same time. The high frequency trader sees it at exchange one (because your electronic signal gets there first) and then gets to exchange 2 ahead of you (because your electronic signal takes slightly longer to get there) and pushes the price up so you are forced to pay more. They are effectively front running you...and the system is designed to let them do this. You as the investor get screwed because you are forced to pay a higher price than you would if you could have gotten all the shares at the market price. Although this affects large shareholders more than small investors the reality is that even as a small investor you end up paying more for your shares than you have to. The difference can be tiny but these tiny amounts add up to huge profits for high frequency traders. I won't go into more detail - but will let you read the book. It is a fascinating expose on a little talked about industry. Getting into debt around Christmas is incredibly easy. It is easy to fall into the spending trap and to feel obligated to spend large amounts of money. The constant bombardment of advertising at this time of year was what prompted me to write my article providing 5 tips on saving money this Christmas. However this year I noticed another worrying trend when it came to advertising: the number of payday loan companies that started to advertise on the radio, internet and on television. "Strapped for cash...stop the worrying and say yes" type advertising that most of us should ignore. I have talked about how the best way to get ahead is to avoid credit card debt (where the interest becomes payable). The interest rates on credit cards run at 19 - 22% p.a. which is outrageous...at least I thought so until I saw the types of rates being charged on cash advances. The first site I clicked on charged 24% for a 30 day loan...24%...that's not a per annum rate. That is the rate over the 30 days. That is a 966% interest rate per year (compounded). But what if you need the cash right now? Should I take a pay day loan? No! There is almost no situation I can think of where you should take a pay day loan. And it's that time of year already. This is the time you should start setting your goals for 2015. Leave it any later and the holiday season and holiday mood will over-take you and you will get nothing done. Leave it until next year and you're already behind the 8-ball. Note that these don't only apply to financial goals - I talk about financial goals on this blog because that's what this blog is about but I do this for every goal I set for the year. How many times have you made a new years resolution at a party on new years eve or perhaps the next day or week and then have forgotten about it? Maybe it was to lose a few kg or perhaps it was to pay off some debt? It's too easy to forget a goal and not hold yourself accountable if you don't write your goals down. So write them down. Start a blog if you want to and track your progress towards your goal (that's what I did with this blog!). Or just keep it simple and write them on a piece of paper. I wrote mine in a little notebook I keep on my desk. For 2014 it had 8 goals (of which I managed to achieve 5 and get awfully close on 1). Christmas is an expensive time of year for a huge number of reasons: you have to buy presents for family and friends, you need to book new years events and there are dinners to attend (or to host yourself) as well as work functions and whole heap of other things to do. I love Christmas and everything that comes at this time of the year but it does get expensive. Here are 5 simple ways that you can save money this Christmas (I'm doing all of these this year). Christmas gifts can get incredibly expensive especially if you have a lot of close family and friends. It is easy to see an item and think "oh my mum would love that" and then pick it up only to realise far too late how much you've actually spent cumulatively. If you have to give presents to a large number of extended family consider reducing the amount you spend per person because even $30 - $50 per person can add up very quickly. Large and close extended families are awesome however they can be a real problem around Christmas time because gifts cost so much. It can get especially painful if there are lots of kids involved because there is no way you can get away with a $10 box of chocolates or skimp out. What you can do is to have a chat about this with your family and institute a Kris Kringle or Secret Santa program. These programs work for multiple reasons - it saves you time and money and people actually get better and more thoughtful gifts and they can be pretty fun around a Christmas tree if you have a large family gathering. Set a maximum amount that you are allowed to spend per gift - this is crucial. What drove my net worth performance this month? My credit card balance at the end of the month was ~$1,500. I haven't had a balance this low in nearly 2.5 years! This was driven entirely by the fact that I had saved for and cash funded my holiday expenditure. The budget I set at the start of the year is really starting to pay off! What is my outlook for next month? Last month I knew my bonus was coming however I didn't realise how good it would be. I targeted $550,000 and was happy to more than exceed this number. In the coming month I don't have any 'big positives' coming and I'll probably be spending a bit on Christmas presents and the festive season. I am also hoping to have purchased my sports car (which is going to cause a definite hit to my savings balance). 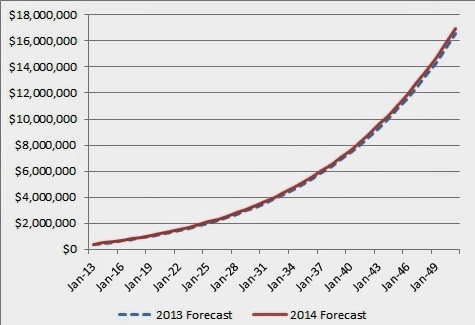 I am therefore going to keep my target for December 2014 to be a net worth of $550,000. If I complete the year having achieved this I think I'm going to be pretty pleased with the outcome! I have been talking about buying a sports car for years and it's finally in progress! After humming and hawing and budgeting and saving it feels good to make some concrete steps towards buying this car. As you could probably tell from the title of this post I am not going down the conventional route when it comes to buying the car. I have decided to import a luxury / sports car from Japan and below I'll outline why and how I'm going to do it. Why on earth would you want to import a car from Japan? So why didn't I buy a second hand one in Australia? How do you know what you're getting when you buy overseas? Aren't I going to have issues with insurance and repairs? Insurance is the one big draw back of getting a Japanese import. Insurers generally hate them and the ones that do insure you will charge you a massive amount. However when I got a quote for insurance on the car I was quite pleasantly surprised. Although it is $500 a year more than my current insurance it certainly wasn't the massive bill I was expecting. Repairs aren't going to be an issue either. I did a lot of research on this topic and it isn't really an issue because it shares an engine with the Nissan 350z which is sold here so there are plenty of parts around. You generally have to wait for body parts to arrive from Japan which is a 2 - 3 week wait but that isn't a big issue either. The thing about importing a car is that you have to wait for the car you want to come up at an auction. I have appointed a broker to help me facilitate this process and provided him with my budget and requirements. My request for a sunroof means that I am going to have to wait a lot longer than I would normally...and I've given him quite a challenging budget so it will be interesting to see whether I can get exactly what I am looking for. So far I have paid the $1,100 broker fee (which needs to be paid upfront) but nothing else. As I get further along in this process I will keep you up to date. As with my wedding spending I am not going to do a whole heap of posts on this topic but if you're interested shoot me an email and I can give you some great reading that I've done on the whole import topic. Many thanks also to one of the readers, Mike, who put me onto the whole concept of buying cars at auction. I really do get a lot of knowledge from those who shoot me emails and ideas. Delayed gratification is great...but can we take it too far? A few months ago I asked whether there was a right way to combine finances with your partner. I received some great tips both from the comments on the website and from some very detailed emails that people sent me. What I realised was that everyone's situation was different and it completely depended on the couple involved. In my original post I outlined some of the ways that couples combined their finances. In this post I will talk about transitioning to such an arrangement - i.e. how do you combine finances with your partner smoothly. Be broke (or not have a lot) when they combined finances - combining nothing is quite easy to do! If you are thinking about combining finances when you're a bit older and if you're the type of person that thinks about things far too much (like I do) then mashing together two peoples financial lives straight away doesn't seem like the best idea. Eventually your finances will probably be completely shared and then something frivolous like a sports car becomes a joint decision but early on it should still be yours and transitioning to combined finances helps with this! I don't often go to Casino's. It's not that I have a particular moral objection to them - I just prefer not to play a game where the odds are mathematically tilted against me. However I went to a casino recently (context to come later) and after doing so I now have new rules for myself about gabling generally. How did my personal rules for gambling come about? I was at a bucks night recently (getting married seems to be the thing to do amongst my friends at the moment) which ended up at a casino after several hours of drinking. We left the casino to go elsewhere however ended up back at the casino later in the night. Before I go into what I saw and experienced that night let me just say upfront that I did not lose thousands of dollars and this is not a post of regret. I bet $20, at one point in the night I was up $100 and I ended up down $10 at the end of the night. I love people watching however people watching in a casino is one of the most depressing things I have ever done. I was just on the regular gaming floor (on the cheap tables I may add) but the amount of money being bet was still staggering. Around Valentines Day this year I set out my plan to save for a ring and ultimately marriage. I had heard how much marriage costs and I didn't want to have any sort of bill shock when the inevitable expenses actually came around so I decided to spread some of the expenditure associated with marriage. I'm glad to say that the first part is done and dusted. I bought the engagement ring (for $10,000), got the GST back on the ring when I went overseas (-$909) and then spent about $1,500 on the proposal itself. I was about $600 over budget but in the grand scheme of things I'm not too worried about that. However, being proposed and being able to talk about the wedding with my fiancée has helped clarify what we want to spend and how much we're probably going to need for the wedding. How much are you going to spend? When are you going to need to spend it? I had originally forecast $30,000 for an August wedding in 2015 however once my fiancée and I sat down and did the numbers we realised that we would probably need to spend more and save it in less time. I under-estimated how many people we had to invite. I had originally forecast an August wedding and had set my savings plan up accordingly. However when we worked out when we actually wanted to get married we realised that we were actually looking at early July (due to my work commitments in August). I have been talking about buying a sports car for years. I have mentioned to everybody...my friends my family and I have talked about it on this blog more times than I can imagine. The excess cash from these two factors should cover the 'over-spend' on other items throughout the year which leaves me free to spend my original budget on my sports car. I have been off for several weeks as I travelled around South America. The trip was fantastic and was one of my financial goals outlined at the start of this year. I returned home yesterday and am still recovering from the jet lag. I will be returning to my regular posting schedule over the coming weeks. Although my assets didn't move significantly, this month saw a big decrease in my debt balance as I paid down my credit card. There will be several swing factors in this coming month. My bonus gets paid which is always a big positive however there will be A LOT of negative factors including 5 weddings (and bucks nights) which are likely to see me out of pocket ~$1000 in gifts and entertainment, I need to pay my tax bill (no refund for me this year) and other bills which all see to fall due at the same time. I have not yet decided whether I will include the cash from my bonus in my net worth as I am using it to buy a car. If I buy the car in November it will not make a huge difference as it will net out but if it takes me longer than that I am likely to see a big positive followed by a big negative. Assuming I do include it I am targeting a net worth of $550,000 for the month. I will do another post on why I spent less than I had budgeted but I came back from my holiday with $1,500 more in cash than I had originally thought I would. This coming month should be interesting, with my bonus payout, my car purchase as well as a lot of other expenses that I mentioned above. I am starting to look forward to writing up my annual performance in a few months time. I really hope I managed to stick to this budget. Tracking every dollar has been a bit of a pain however it really has helped me focus my spending. What is a cheap, safe way to travel with money around South America? What is a normal home loan interest rate? When you look to buy a house, chances are the first question you will ask is "how much can I afford to pay" which is really asking the question "how much can I borrow?". Once you know how much you can borrow, you can go out house hunting and buy that perfect home. Unfortunately most people just Google one of those home loan calculators or go into a bank branch and ask them how much they can afford to pay and don't look at the biggest assumption that will determine the answer to the original question...the interest rate on the home loan. In Australia, most loans are variable rate. If you are lucky you may be able to lock in a 5 year fixed interest period but for the majority of your loan you will be paying an unknown rate of interest. Why is this a problem? The problem is that most 'affordability' calculators assume the prevailing interest rates or they may have a small buffer in there if rates move. In Australia the current rate of interest is ~5% on 30 year mortgages but will it stay like this forever...and will you be able to afford the interest bill if the interest rate moves? The question we should be asking is: What is a 'normal' home loan interest rate? The problem with this question is that there is no right answer. Economists will argue until the cows come home what a steady state 'normal' interest rate will be but the fact is that it will all depend on the economic conditions and government policy in the future and there is too much uncertainty around that question. So how do we deal with the uncertainty associated with unknown future interest rates? I did my own taxes...and it was great! I am usually terrible at doing my taxes on time. I always have the receipts sorted out and spreadsheet done well in advance however when it actually comes to seeing the accountant and submitting my taxes I tend to procrastinate for weeks or even months. Last year I submitted my taxes 6 months late. Why did I do my own taxes? I virtually do them for my accountant anyway! Would I do my own taxes again? I managed to get back into positive growth with my net worth this month but it was a close run thing. There were a range of factors which influenced this outcome which I will go through below. This post also includes my expenditure tracker which helps me track my financial goals for the month. There were a range of factors which influenced my net worth this month. The share market was a significant negative (and although I felt that a correction was coming I didn't alter my portfolio in time) however a range of small factors all combined to ensure that I was still slightly ahead for the month (although I did miss my target of $510,000 for the month). A few years ago I came to the realisation that you can't do everything yourself when you are setting up your own small business. You really should get help in areas that you are weak in so that you focus your time on the areas where you really add value. In that post I mentioned that I was seeking help from a friend who had experience doing what I wanted to do. The problem with using friends is that they are doing you a favour and so you're less likely to be go back for exactly what you want and also you can't push them to get the work done. So what is the solution? Easy...outsource some of the tasks that are incredibly time consuming for you but that others have expertise in. The biggest block that most people against outsourcing is it's cost. Most of us like to test our ideas out before really committing some capital to it. But outsourcing doesn't have to be expensive. In fact it is incredibly cheap for some things! Scale backs...why do you bother me so? I recently wrote a post outlining my dilemma about investing in the most recent QBE share purchase plan. I had already been stung once by a massive scale back and I wasn't keen to go through that experience again. I phrased my dilemma as 'fool me once shame on you...fool me twice shame on me'. As it turns out I was fooled twice and this time the fault is definitely my own. However that being said it wasn't nearly as bad as last time. While it is true that you can make a lot of money from Share Purchase Plans, it is also true that you can effectively lose money if you get scaled back significantly. I had experienced a significant scale back on the last QBE SPP and so was very aware that this could happen again. Investing is all about learning from your previous experiences, and also from your previous mistakes and I was glad to learn from that previous mistake because it informed my decision making in the most recent share purchase plan. In the last QBE SPP I applied for the maximum amount of shares (set at $15,000) in the hope of maximising my profits. When I got scaled back this also resulted in me having the greatest opportunity cost loss. I realised that this could happen to me again and so I only applied for the smallest possible parcel ($5,000). Is there a right way to combine finances with your partner? Over the weekend I proposed to my girlfriend and we are now engaged to be married which is incredibly exciting. I have been talking about doing it for so long on this blog that it a little surreal that the event has finally come and gone (although now a whole set of new planning starts). A few months ago I wrote a post about money and relationships which encouraged readers to communicate with their partner to avoid misunderstandings, but also to make sure you are on the same page when it comes to finances. For once I have been taking my own advice and my girlfriend fiancée and I have had some great discussions about our goals and objectives. I have taken a poll of my married friends and friends that are in long term relationships and the number of systems are as varied as the number of relationships. "I look like I am struggling to make ends meet"
It's also not great for my career. The way you dress and carry yourself is incredibly important to how you are perceived and this is definitely not the look I want to be going for. So how did this come about? I'm going to blame it on my budget and more accurately my focus on my budget this year. In prior years I have had a fair bit of flexibility in my budget and when I have run over on some areas it hasn't really affected any other areas. If I have budgeted for all of this...what's the problem? We all need to withdraw money from savings...but make sure you put it back! If you have ever set yourself a budget you will know that things don't always go to plan. Sometimes there are unexpected expenses and sometimes you just spend more than you wanted to on a night out. One thing I realised since I started tracking my expenses fairly religiously was that if you 'write off' a month as bad you will never really catch up again. You need that bad month to be made up by a good month later down the track. Writing off the month mentally makes you reset to zero and you go back to trying to make your budget in following months. I think this is a bad way of approaching it. Bad months need to be compensated for. 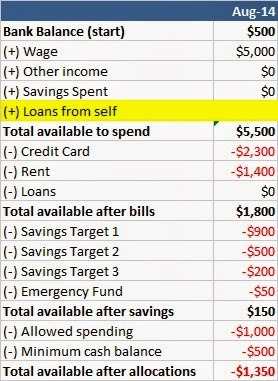 You need to replace that amount you have taken out of your savings account or actually contribute that amount you didn't contribute in a previous month. If you have a way of tracking your unexpected withdrawals from savings then you can keep track of how much you 'owe your savings account' on a real time basis. Not only does this motivate you to save more or be more wary of your expenses, it also reminds you that when you are having a good month that you may need to contribute a little bit extra to your savings account. If you want a way of tracking the deviations from your budget I recommend the following method. I have been using it for a few months and have found it quite effective. If you're an Australian like me and travel overseas you have probably noticed that the immigration form on the way home has a question about whether you are importing anything in the country with a value over $900. Did you realise that there was a way that you could save money even if you don't buy something overseas? What is the Tourist Refund Scheme? The Tourist Refund Scheme (TRS) is an initiative by the Australian government to encourage people to buy goods and services in Australia. It allows you to get back the tax you paid on the item when you leave the country with that item. For most items this will be the Goods and Services Tax (10%) that you paid although for some items it may be even higher (e.g. wine gets 14.5% back). My long awaited annual overseas holiday is coming up and I am excited! I am going to Latin America for the first time and I have been planning this trip for months. However, as with any international trip you need to have plan for how to carry your money around when you are travelling. Several of my friends had their accounts hacked when they were in South America so I spent a fair bit of time and effort developing the following plan which I wanted to share with you all. If you withdraw $100 in cash you're paying ~$10 (or 10%!) in fees and getting nowhere near what you thought you would be getting in foreign exchange. You try and minimise the impact of the fees by withdrawing large amounts (e.g. $1000) but you are still paying $50 in fees. This post covers my net worth and budget tracker for the month. This month I suffered only my third monthly loss since I started tracking my net worth more than 3 years ago. For an overview of what drove my performance keep reading below. In my last net worth post (July 2014) I mentioned that I expected this month to be challenging driven by the fact that I was buying a diamond ring to propose to my girlfriend. I had hoped to stay even with last month's performance (at $510,000) but in hindsight I was lucky to only be set back one month. My portfolio increased nearly 2% over the month almost entirely driven by my investment in FKP (which I have written about extensively before). I am currently looking to sell down this investment as it has performed well beyond what I expected. My employee share plan vested and I received the inbuilt profit associated with these shares. 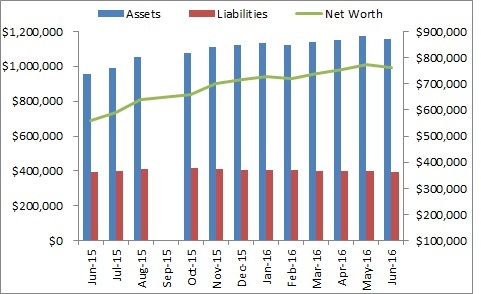 I recently started accounting for the tax owing on these transactions as part of my net worth performance so the gains aren't quite what they used to be! I lost money on the last Share Purchase Plan...do I try again? "Fool me once...shame on you; Fool me twice...shame on me". That old proverb is ringing in my mind as I try and decide how much money I want to commit to the QBE share placement plan (SPP) that was announced in mid August 2014. This is not the first time that I have had to decide to participate in an SPP run by QBE Insurance. The last time was in 2012 and I saw an opportunity to make a nice little profit. However, as I documented on this blog I got scaled back to such an extent that I actually made an effective loss if you account for the amount of time that they held my money before returning it. I had applied for $15,000 in stock but received a paltry $32.10 and had the rest of my cash refunded to me. I thought I would quickly run through how you can make money from share purchase plans. In fact it is quite similar to making money from a rights issue: You don't make the money from taking up your rights - the share price should adjust for this. You make your money from the difference between the price at which you buy the shares and the theoretical price the shares should trade after the raising. For example. Assume Company A is trading at $10 per share and there are 100 shares. If you are finishing up your college or university degree or have just started working you may be looking at ways to invest your new hard earned cash so that you can get ahead financially and can afford the nicer things in life. There are a million options and as many tips out there on how to do this. Regular readers of this blog will know that I have tried for several years to set up my own small business. It has been far more challenging than I first imagined but then two months ago I finally got my new business up and running. It is an Investment Banking blog (I've linked to it here) and my approach with this blog will be much more commercial (over time) than the current blog you are on which is much more personal in nature. I rarely make blanket statements on this blog about investing. I think investing is inherently nuanced and specific to the individual making that investment bias. However there are some rules which you should never break in the investment world and today I am going to talk about one that I constantly break and which makes me a worse investor as a result. Knowing why you are invested in a stock is very different to knowing why you invested in a stock in the first place. However all to often we don't really care about those investments that hadn't done anything. The companies could have changed substantially along with their risk profile and the opportunities associated with it however we do nothing because in an investment sense they have not done anything to cause us to turn our attention to them. If you are looking to buy a diamond engagement ring for your girlfriend it is probably best to start with Part 1 of 'How to Buy a Diamond Ring' guide which covered Knowing your Girlfriend and Setting and Sticking to your budget. Part 2 covered the 4-C's of buying a diamond and the research you should do before going into a jeweller. How many should you visit and what should you say? I should address one point upfront. I do not cover how to buy a diamond ring online in this guide. I didn't go through that process myself. I thought about it however preferred to examine the ring and the diamond myself my before buying it and you can only do this at a physical jewellery shop. When you decide you have done enough research and actually want to get out there and actually buy the diamond you will realise that every jewellery store you can think of sells engagement rings. So which ones should you go to? I highly recommend getting recommendations from friends. Ask them where they went, what their experience was, how helpful the person that served them was and whether they seemed to know about diamonds. Most guys that have gone through the same process you are have done heaps of research and are more than happy to help you in your search. If you are the first one getting engaged go online. I found that diamond jewellers are the one type of store that people are happy to post both positive and negative comments about online (unlike most other stores where there is an inherent bias). Never just visit one store. Diamonds are different, as are the settings and stock that different stores have. Just because one store doesn't have what you are looking for doesn't mean another wont. Going to multiple stores will also give you a good feel for prices. Don't be afraid of asking for prices on everything and writing it all down. It will help you realise what is a good price and what you should be negotiating down. The benefit of visiting multiple stores cannot be overstated. For example Tiffany was probably the 6th or 7th store I visited and because I had a good idea of prices I saw pretty quickly that their prices were approximately double for exactly the same piece of jewellery. Step 6: What should you say when you visit? Am I still confident of hitting my $90 million goal? That's a question I ask myself now and then. My goal seems so large and unattainable at times. This is especially true whenever I do my net worth update every month...the incremental improvements seem so small in light of the overall goal. You may have thought that I would be giving up on my goal from the paragraph above but the fact is that I am more confident of achieving my goal this year than I was last year. What gives me so much confidence? I confess when I first did that post (and when I passed on the excel file to any readers that wanted it) I knew that the numbers were fuzzy. I knew that they made really broad assumptions and life rarely goes to plan. After all if it were that easy wouldn't everyone be there? Well now that I am a year down the track I can assess it so far. The excel file suggested that at June 2014 my net worth should be $457,000 however if you look at my actual net worth for June 2014 you will note that I was actually significantly higher than this at $503,000. Not only does this start to prove up the fact that I can get to a reasonable net worth...it also gives me hope that I can better this if I can start businesses and bring in additional sources of income. Investment Basics: What is the P/E ratio? Any investment book that deals with stocks (see a few of my recommended ones here) will mention the P/E ratio of a company (Price to Earnings Ratio). Most of them take it for granted that you know what it means and if they do explain it, it tends to be at a very high level. This post will break down the P/E ratio so that the next time you are looking at a stock you know what you are actually looking at when you look at the ratio. That's actually all a P/E ratio is. People often assign all sorts of interpretive power to a P/E ratio but in fact it provides nothing more than a tool for comparison with other companies. How is the P/E ratio calculated? What does the P / E ratio mean? Have you, after much thought and deliberation, worked out that your girlfriend was the person that you wanted to spend the rest of your life with? Have you then realised that you need to buy a ring and know nothing about it? Well then this guide is for you. If you're just starting out check out Part 1 of my How To Buy a Diamond Ring guide. It covered knowing your girlfriend as well as setting your budget and sticking to it. In Part 2 I will be covering the nitty gritty of diamonds and the research you should do before going to visit any jewellers. Step 3: Understanding diamonds...what does it all mean? If you start looking for diamonds you will be confronted with a whole lot of terminology which is a little bit confusing. The most important thing to remember are the 4-C's. These are the four most important parts of a diamond and determines the cost of the diamond. They are Cut, Colour, Clarity and Carat. They are not all created equal so make sure you understand them before you go out ring hunting. Here is a very brief overview of the 4-C's. The cut of the diamond is the most important characteristic of the diamond as it determines how brilliant the diamond is (i.e. how much it sparkles). Note that it can get confusing because the word 'cut' is used in two different contexts. It is used to both describe the shape of the diamond (i.e. round, princess, pear etc) as well as the quality of how the diamond is actually cut. While the shape of the diamond does matter (round diamonds cost far more than the others...because they sparkle more) it is the quality and grading of the cut that is most important. I could get into details on the cut of the diamond but there are other sites which will provide you far more information on the specifics. Basically, a diamond with a better and higher quality cut will reflect light significantly better and there will be less leakage of light. Once again this comes back to how brilliant the diamond looks when you look at it. The reason that the cut is the most important factor is that it really does affect how much the diamond sparkles. If you are tossing up between different diamonds and are trying to weigh up what is important you should always go for a better cut because a smaller diamond with a better cut will often look bigger than a larger diamond. If you can ask for '3 ex' (which stands for excellent-excellent-excellent) when you buy the ring. Try it - compare a '3 ex' cut to another cut and see whether you can tell the difference. I certainly could when I started looking at actual diamonds. Diamonds come in different colours. The clear ones you are used to seeing on girls hands and on television are actually colourless diamonds. However there are a range of colours from D (colourless) all the way down to Z.
Diamonds in the D - F range are called colourless and are the most highly sought after diamonds. Technically diamonds classed as G not colourless however you would never be able to tell the difference. After G though the difference is quite noticeable so I would avoid anything rated less than G.
This post covers both my net worth performance for the month. It also includes my expenditure tracker, a series of posts I use to track how good I am at actually sticking to my budget. I combined the two topics as they are inherently interlinked. When I wrote my June 2014 net worth I genuinely thought it would be a month where not a lot happened. As it turns out I couldn't have been more wrong. I had some really big expenditures come through however the strong performance in the share market completely offset the impact of these expenses. I was targeting a net worth of $508,000 for the month and was happy to beat this. I am going through the same process that you're all going through and I know how painful it is so I have put together a guide. It turned out to be far longer than I originally planned so I have split it over two posts. The second post will come later this week. Before you even think about looking at diamonds you need to know the girl you are about to propose to. Here are some things that you will need to know at a minimum before you even think about starting to look for a ring. A. Does she actually want a diamond ring? For most guys this will be a resounding 'yes' (it certainly is for me), but there are some girls who think that the whole concept is a bit silly and actually prefer something simpler, cheaper and more meaningful. If you have one of these girls your life just got a whole lot easier (and cheaper). So how do you find out. The easiest way is to just start a conversation about engagements and proposals generally. This is much easier if you are in the age group where everyone is getting engaged. Ask what she thinks about her friends rings, and when she meets people who have just gotten engaged does she want to see the ring? B. What is important to her? Self Managed Super Funds are closing! This is a guest contribution from Mr Ikonz, of Project Ikonz. Whilst we all know that self managed super funds (SMSFs) are the fast growing sector in the superannuation market, it’s important to remember that they aren't for everyone. All the stats that you see and all the media reports focus on the continued growth of SMSF accounts, but not a lot of people focus on how many SMSFs are wound up on an annual basis. Did you know that according to the ATO, in the 12 months to 30 June 2013, 2,230 SMSFs were closed? In the last 5 years, over 38,000 SMSFs were wound up!! What are some of the reasons why an SMSF might be wound up? 1 - They aren't as easy to run as you would think. The name says it all! SMSFs are self-managed, meaning that you will need to take on the workload of a trustee, which previously was designated to a fund manager. This work includes managing the asset allocation, administration, account and audit of the fund. Whilst you can certainly outsource a lot of this work to experts such as accountants and financial advisers/brokers, as the trustee, you are still responsible for the running and compliance of your fund. Not an easy job! One Up on Wall Street is an investing classic and a book that every small investor should read. I first read this book when I was starting out on my investment journey and I re-read it again before writing this review. If anything I liked this book more the second time around as I more information, more context and I was more used to investing in stocks. When it comes to books on investing I think the author is incredibly important. I like authors to have track record in the real world of investments. I would rather take advice from someone who has been there and done than in a very public and scrutinised way rather than those who say that they have earned significant returns using some strategy or another. Peter Lynch has everything that I look for in an author even before I start reading his book. His investments were incredibly public (he headed up the Magellan fund at Fidelity Investments) and his returns were spectacular over a long period of time (he averaged a return in excess of 25% between 1977 and 1990).